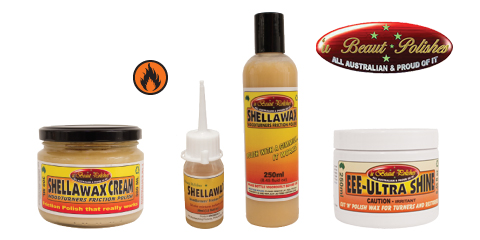 This is a very popular, easy to use, one-step finishing product from Australia Made from a mixture of shellac and wax, Shellawax Cream Friction Polish leaves a protected surface with good sheen and excellent depth to the finish. This is a good finish for many small and large projects. The Cream is best for bowls and other larger projects. The liquid is faster drying and best for small projects like pens. Above we have a quote from Vic Wood, a professional woodturner and internationally known demonstrator and teacher who uses Shellawax in his classes. Comes in 250ml white plastic jar (about 8.5 fl. oz). This fast drying friction polish is best for smaller projects due to its fast drying characteristics and glossy shine. Applied while the workpiece is still on the lathe. It is popular with woodturners worldwide. For the best possible finish, use Ultra Shine Polish before applying Shellawax. After sanding to 320 grit, the abrasives in Ultra shine will improve the surface to the equivilent of 1200 grit! Sand to a higher grit first and get even better results. Many people have requested this product so we added it to this catalog. Comes in 250ml (8.5 fl oz).